Devin Hester has gone on to bigger and better things—the Pro Bowl and the Super Bowl, to name two—but perhaps his most famous punt return came against Duke in 2005—sort of. 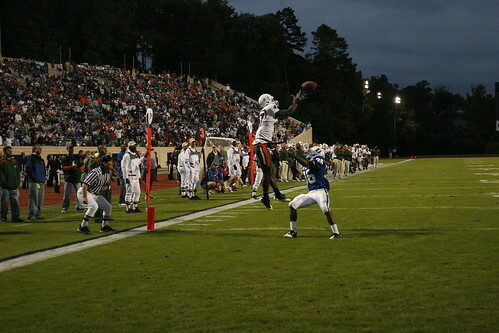 Hester’s most-viewed YouTube clip depicts him criss-crossing and weaving through the Blue Devil special teams unit for a touchdown that was eventually negated by a holding call that barely affected the play. For those of you who haven’t seen it, watch the video below and you will soon realize the fuss. And for those of you who have, it’s always worth watching again. When Miami comes to Wallace Wade Stadium Saturday, Hurricanes quarterback Jacory Harris and Blue Devil signal-caller Thaddeus Lewis won’t just be looking to improve their teams’ ACC records. The two have a bit of shared history from their time as high school quarterbacks in Miami-Dade County, Fla.
Harris, a freshman who splits time with Robert Marve, and Lewis, now a junior and the solidified starter, grew up about 20 miles away from each other in South Florida. Harris took the starting job at Northwestern High School in 2006, when Lewis was already getting settled in Durham, so the two never met on the gridiron in Florida. Nonetheless, Harris could have chosen to play another position or another sport altogether in 2004 and 2005, but stuck with quarterbacks thanks in part to Lewis’ guidance. Lewis earned team MVP honors in his last three seasons at unheralded Hialeah-Miami Lakes Senior High School, a school with no district championships since 1990. Harris, meanwhile, quarterbacked powerhouse Northwestern to state championships in 2006 and 2007; last season the Bulls also defeated Southlake Carroll High, one of the best teams in Texas and the school that produced Missouri star Chase Daniel, en route to an unofficial ranking as the nation’s best team. For comparisons of the two schools’ pedigrees, just check out their records from last year. Northwestern went 15-0, including a 63-0 thrashing of Lewis’ alma mater, and a whopping seven Bulls received scholarships to Miami; in contrast, Hialeah-Miami Lakes went just 1-10 in 2007. The recent differences between Miami and Duke are vast, but nowhere near as oceanic as that. Blue-White Set For 1 p.m., Miami Game For 3:30 p.m. Some scheduling updates from the ACC and athletic department today: Because Duke’s Oct. 18 game with Miami was slated for the 3:30 p.m. ESPNU slot by the conference, Mike Krzyzewski and the Blue Devils’ Blue-White scrimmage was scheduled for 1 p.m., the program announced today. The team’s intrasquad scrimmage is typically held at night, but the football game likely won’t be over until 7 or 7:30 p.m. Still, the night setting of the season’s tip strikes us as appropriate. Why not hold Blue-White at 8 p.m., or, better yet, one hour after the football game ends? That way, you encourage people to go to the football game to know when Blue-White will actually start. It’s not like you need to worry about the other team. One more subplot is Blue-White’s effect on Tailgate. 1 p.m. is prime Tailgate time for most of the Duke student body, especially on Homecoming weekend. What will students do? What will alumni do? How will attendance be affected without the normal flow of parents and family? We’ll get administrators on the phone tomorrow, but, in the meantime, what do you think?